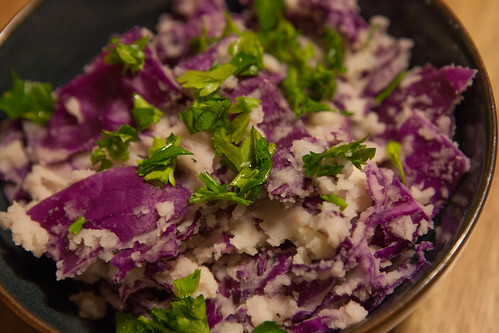 From Happy Herbivore Abroad , a traditional Irish dish of mashed potatoes and cabbage. The author, Lindsay, adds parsley, mustard, and nondairy milk (I used soy). Cabbage is a vegetable that I want to include a lot more of in my diet: It's cheap, tasty, nutritious, and versatile. In addition to this dish, I've made a couple of great SOS-free recipes from Straight Up Food using cabbage. I'll post one soon. ETA 9/29 - since it's near the end of VeganMofo and I haven't gotten to all the recipe posts I'd planned, here are quick links to the SOS-free cabbage recipes from Straight Up Food: Creamy Coleslaw and Cabbage Salad with Dijon-Lime Dressing.